Automated billing software with the features you need for all your subscription management, recurring billing, payment collection and more. The Leading Automated Billing Software. Setup new product subscription plans in minutes. Eliminate error prone manual processes and billing bottlenecks. Ignite your growth with our advanced features such as hierarchy relationships, projected invoicing, predictive billings and inventory tracking. Fusebill's subscription management module allow you to provide your customers all the flexibility they need to view their invoices online, update payment methods, and make payments – while automating and organizing all the information. Reduce churn with hosted self-service portals and check-out pages. Efficient recurring billing is critical for subscription based business success. Our industry leading, flexible product and pricing catalog, specializes in this vital business process. We provide you with all the variations you may need: usage-based billing, one-time, and tiered. All of our catalog options are supported by our flexible discounts and coupons module. Fusebill Payments is the fastest and easiest way to get paid. Manage your entire subscription lifecycle through a single system, reduce failed and late payments, decrease payment processing time and lower your total cost of ownership. Why settle for just a gateway when you can harness the power of an integrated automated billing software as well? Have business specific revenue recognition needs? Manage your earned and deferred revenue in spreadsheets? Fusebill's automated billing software allows full customization of Revenue Recognition rules specific to your Business and keeps track of everything in real time reports to remove the pain of month end closing. Our automated billing software also supports over 20 popular gateways. Offer your customers a wide range of payment methods including credit card, invoicing, ACH, PayPal and offline. Fusebill's vault removes the security concerns for storing sensitive information. Our credit card updater saves your team valuable time. 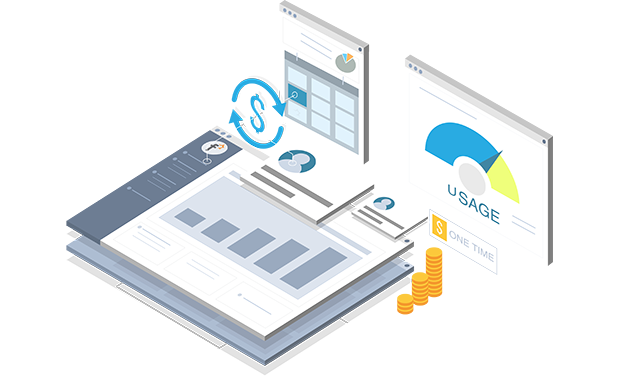 Fusebill tracks all of your key business metrics in real time via elegant dashboards with all of the displayed data available in detailed, exportable reports. See instant reporting on key metrics such as MRR, Churn, LTV, AR & cash collected which are the life line for any subscription based businesses. Fusebill is PCI Level 1 certified so our customers can trust us with their most sensitive customer data. With multiple data centers across the country your data is safe with us. Our systems offer uptime of 99.95% 24/7/365 resulting in an always on service for our customers. Our security and technology safeguards ensure your peace of mind. Integrate a powerful automated billing software with your technology stack. Connect Fusebill to your favorite CRM, Revenue Recognition, Accounting, Business Management tools, and Payment Gateways. Enhance efficiencies and ensure a better customer experience. Fusebill has scaled with us as our needs and processes have change allowing us to maintain a 50% annual growth rate and double our number of product offerings each year. Ready To Ignite Your Growth With Subscription Billing?